I usually prefer to write scathing reviews. If given the choice, I probably would rather review a book I hated than a book I loved. There’s just so much more to say. But in this case, I really wanted to love this book. Or at least like it. It had so many promising features: it’s set in Atlanta, the word Peregrine is in the title which can only mean good things, orphans, magical creatures, secret worlds, little drawings, etc. etc. I rarely come across a kid’s book set in Atlanta, so that was pretty exciting for me. Later, I was relieved to read that the author is from England, not Atlanta. This explains why all of the ‘Atlanta’ references read as if they were lifted from a travel guide. This is completely unnecessary—none of the plot hinges on the setting being in Atlanta—so there’s no need to be so heavy-handed with the Peachtree references, or try to work the Braves into completely unrelated sentences. It felt like they were inserted later, or corporately sponsored. 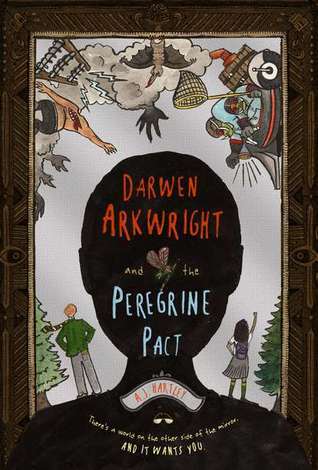 In Darwen Arkwright and the Peregrine Pact, Darwen Arkwright, our protagonist, is an orphaned Briton, recently displaced from his working-class neighborhood to his aunt’s chic apartment. While wandering around the mall (probably Lenox I’m presuming), he sees a large bird. This bird, unlike the typical sparrows you see trapped inside shopping plazas, is a large, leathery bat-type thing with the face of a man. Darwen follows the bird-thingie into a store in an empty corner of the mall (is there even such a thing?). The store, Mr. Octavius Peregrine’s Reflectory Emporium Mirrors Priceless and Perilous, sells, unsurprisingly, mirrors. And the weird bird/bat/man thing flies into one and disappears. First Mr. Peregrine denies it, before admitting that it’s a flittercrake. He doesn’t offer much more information than that, but he does give Darwen a parting gift, a small mirror. Now, I personally wouldn’t accept a mirror from a man that seems kind of crazy from a shop where I saw a creepy bird thingie disappear into a mirror, but that’s why I rarely appear in supernatural children’s novels. Darwen hangs the mirror in his room, and is shocked to find that after dark it becomes a window into another world. So, of course he climbs through it. Luckily he must be the size of about a five year-old to fit through this tiny mirror, but whatever. This leads him into a pretty boring world that consists of a circular path and a fountain. Darwen thinks it’s the greatest though—has a conversation with a fairy thing named Moth, and almost gets killed by a dark shadow chasing him. Of course, he loves it and can’t wait to go back. When Darwen starts school at a fancy prep school, everyone from the teachers to the students hates him. Which is a good thing for us, because nothing exciting ever happens to happy people. Darwen meets two friendly classmates on his first day (and about a hundred mean ones)—Alex, a really weird girl, and Rich, a stereotypical good-ole boy. He doesn’t much like either one, but beggars/choosers you know the drill. Anyway, Darwen ventures into his mirror again that night, and almost gets murdered by some pig-creatures (Scrobblers) on motorcycles. He barely escapes with his life, and yet Darwen can’t wait to get back there. Darwen joins the archeology club (which consists of Rich, the janitor, a science teacher, and now Darwen). Rich tells him that the school is built on ancient sacred Indian ground. I am unsurprised. Darwen visits Mr. Peregrine again, and learns that while Mr. Peregrine is a guardian to the mirrors, he can’t go in and out of them like Darwen. Being a mirroculist (that’s what its called, okay?) is really rare and Darwen is probably like, the only one. Also, the worlds inside the mirrors are governed by 12 old guys (this is important later). In archeology club the next day, Rich and Darwen find what look suspiciously like Scrobbler remains buried behind the school. Then Darwen accidently brings Alex into the mirror with him. The Scrobblers and other nefarious folk have destroyed the fountain and the fairy’s home, and are trying to stretch the mirror frame so that they can fit through. Alex and Darwen travel through some more mirrors to complete this complicated journey Mr. Peregrine has sent them on, but they are almost eaten by monsters. Undeterred, they still love this horrible other world place where nothing good ever happens. Then we find out that whoever is stealing student’s belongings is passing them on to the Scrobblers, who are using them to power their generator. This is explained by the tired, over-used trope that ‘love is the most powerful force.’ Keep in mind that these items that the children ‘love,’ consist of things like bracelets and comic books, and in one case, a tamagotchi. So then, of course, the children save the school from being invaded by Scrobblers, even though we find out that they’ve fixed nothing in the other world and that the bad guys (I’m not even going to use their names, it’s not like that makes it clearer) are just going to attack somewhere else. So either that is an unusual alternative to a happy ending, or there are more Peregrine Pact books to look forward to. Oh boy. The plot in this book was so haphazard, the characters so unlikable and one-dimensional, and everything peppered with cliches and events happening willy nilly all over the place without any regard for pacing or believability. I was most annoyed that the ‘magical world’ sounded pretty much horrible. I would not have gone two steps out of my way to save that place. For reals. This entry was posted on Tuesday, September 25th, 2012 at 2:56 am	and tagged with archeology, Atlanta, fairies, magic, monsters, new kid, talking animals, time portals and posted in Book Reviews. You can follow any responses to this entry through the RSS 2.0 feed. This kid sounds like the Fresh Prince of Atlanta. Is he slumming it at Lenox because he doesn’t think he’s good enough for Phipps? Probably. I don’t even feel comfortable in Phipps. I can afford things at like, the kiosks maybe.